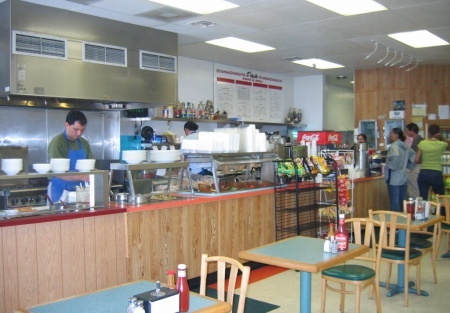 This is a classic Cafe and Deli with ample inside seating and a small patio area. With 34 inside seats and 6 patio seats. This is a great owner operator location with a complete kitchen build out. With a very reasonable base rent of $2,030 for 1,534 square feet and an average of $15,750 monthly revenue this is a great opportunity. There are large County buildings that bring in daily lunch business that are very close by. A major recreation complex is nearby and the road this Caf� and Deli is located on has plans to connect through to major streets in the area. The current lease expires in August, but a three year option is in place. Plenty of parking is right out front and this has been a restaurant for over 23 years. The build out includes a 4 x 8 foot hood, 72 and 48 inch True Sandwich prep tables, two 48 inch food warmers and a 48 inch Salad Bar. This is a great value and if you factor in the fact that it is only open five days a week then it is an even better opportunity!This is a Paramount Restaurant Brokers, Inc. listing. Great Owner Operator Opportunity and the price is right!